A few weeks ago, I had yet another death in my life – a cousin who was the same age as me. I wish I could say that he was the first same-age cousin I’ve lost, but I can’t. In fact, death has been a much more common occurrence in my life than for most people I know. And all of this death around me got me thinking, starting at a young age, about how I actually wanted my life to look. It was one of the factors that prompted me to leave a very successful corporate career to start my own business doing what I loved – on MY terms. It was a factor in my decision to leave a 20+ year relationship a few years ago. It was one of the reasons I moved across the country to beautiful Oregon earlier this year. And it’s why I have recently been choosing to spend a lot more time playing and a lot less time working. What defining moment in your life woke you up to the fact that life is short, and meant to be lived – by YOU, not by everyone else’s “rules” for you? Did you act on that wake-up message and make some big changes? The journey to this point has been a long one for me. And an expensive one as well! Many of you know I’ve invested hundreds of thousands of dollars in my own development in the past few years alone. And yet… I am absolutely convinced that the most important tool that has gotten me to the point where I can create what I want and need with so little work and effort is knowing myself and exactly how I’m designed to create what I want. And yes, this is the Manifesting Design work I’ve been doing with my clients and that you’ve seen countless success stories for in this ezine. It’s been in the unique intersection of the gifts I am here to share and how I’m designed to share them that I’ve discovered this incredible sweet spot. But first I had to know what kind of life I really wanted to live. And how much money I would need to support that lifestyle. And it amazes me how many people have still not made those decisions – at least not in a conscious way. People in their 40’s, 50’s, 60’s, and even 70’s – who still have not made that choice. Way too many people are “letting life live them.“ Living totally reactively. And living from a place of victimhood instead of a place of creation. Is that you? Is there one or more areas of your life that does not look the way you truly want it to? You can have whatever kind of life and business and income you want. But you first must consciously decide. And then you must know enough about yourself and how you’re designed to create in order to create it. If you need a guide, I am here. Some of you have been watching me for years now – hanging out in the shadows, watching me and others live in big ways, and have never allowed yourself to do the same. Life is short. Life is precious. Is it time to start living the life you want now? 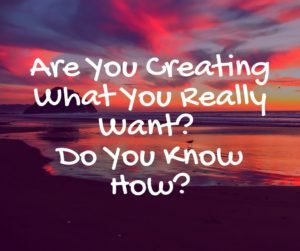 If you’re ready to start creating the life you really want and don’t know how, contact my amazing assistant Kathy Bliss today and see if I can help! « Are You Even Leading YOURSELF?